Start honing your sense of taste for this year's interactive culinary events at PICA's 10th annual Time-Based Art Festival. 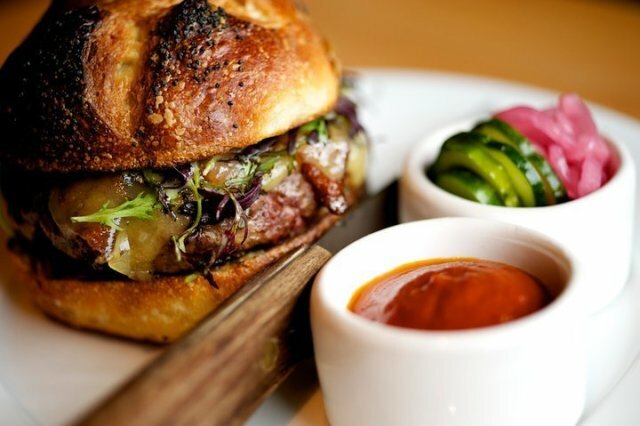 The Grüner burger is truly a work of art. Those familiar with Portland's annual Time-Based Art Festival are accustomed to the stimulating exploration of visual, tactile, and aural sensations, and this year, TBA is dialing up the taste. Entry to the TBA Biergarten is free, and original dishes will be served up at special festival prices before and after performances. Blind-Tasting Bingo: For even more interactive food-based performance art, three chefs--Jason French (Ned Ludd), Naoko Tamura (Chef Naoko’s Bento Café), and Johanna Ware (Smallwares)--will each host a round of "blind-tasting bingo", offering the chance to try 15 small bites with closed eyes and open minds. The $25 tour of tastes will act as an intimate exploration behind each chef's unique flavor palate. Only 25 players will play per game each night (September 11th, 12th, and 14th) so reserve your spot today. The Snack Office: Visitors to the TBA Snack Office will be able to indulge in $1 to $4 snacks that, in a perfect world, might replace the items more commonly found in vending machines. Inspired by Ecotrust's work with school districts, preschools, and child care centers to change the way Oregon's children look at their food, Snack Officers will highlight fresh dishes from the local bounty (like Fifty Licks Ice Cream or ficoïde glaciale with rosemary honey from chef Abby Fammartino (Abby’s Table). For the full TBA schedule, head to the PICA website, and stay up-to-date with Portland Monthly's in depth arts and culture coverage.